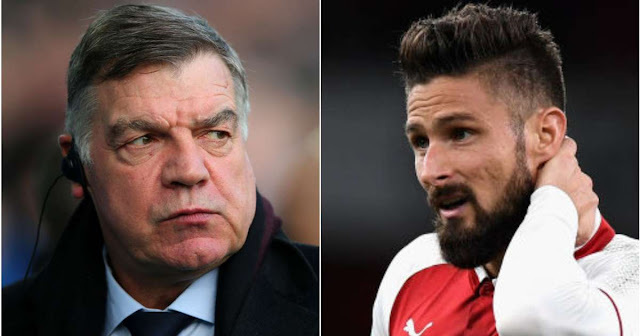 Sam Allardyce has claimed that Olivier Giroud's wife may have prevented the Arsenal striker from moving to Everton last summer. The France international has previously confirmed that he almost joined Everton when Ronald Koeman was the manager, but Giroud opted to remain at the Emirates. The Toffees are reportedly looking to sign a striker in the January transfer window as they continue to look for a replacement for Romelu Lukaku. When asked if Everton were likely to renew their pursuit of the Arsenal striker, Allardyce said: "I wouldn't have thought so because he refused to come last time. Everton's revival continued under Allardyce on Sunday as the goalless draw at West Brom extended their unbeaten run to eight games but they have scored only 24 goals in 20 games in the league this season. Giroud has started just once in the Premier League this season, making 14 substitute appearances and has scored four league goals.